A major Staffordshire employer is benefitting from a healthier workforce after agreeing to work with Staffordshire Chambers of Commerce to promote workplace wellbeing. The Chamber has three government approved Workplace Wellbeing Charter Assessors who work closely with employers looking to achieve accreditation. The pottery company now promotes a healthy lifestyle, regularly putting on awareness raising sessions, stop smoking support and encouraging lunchtime walking groups at its headquarters in London Road, Stoke. Taking part in the programme and achieving Charter status, has led to a healthier, motivated workforce – ultimately improving productivity even further in a well performing business. Alex Darby, HR and Engagement Officer, said: “Portmeirion Group goes the extra mile to help our employees. As a business, we are always looking to improve and we regard the Workplace Wellbeing programme as an additional developmental aid. “We have created a workplace wellbeing programme and anticipate that this will have long-term benefits in terms of a motivated, healthier workforce. “Regular activities and encouraging initiatives such as walking groups will promote a fitter workforce in body and mind. “The whole company has bought into the wellbeing strategy, up to Board level. The Wellbeing programme has helped to develop understanding on how a healthy workforce can add value to the business. This has led to Portmeirion Group hosting awareness raising talks from organisations such as Diabetes UK and fitness coaches from local gyms. Portmeirion Group employs around 600 staff in Stoke-on-Trent. 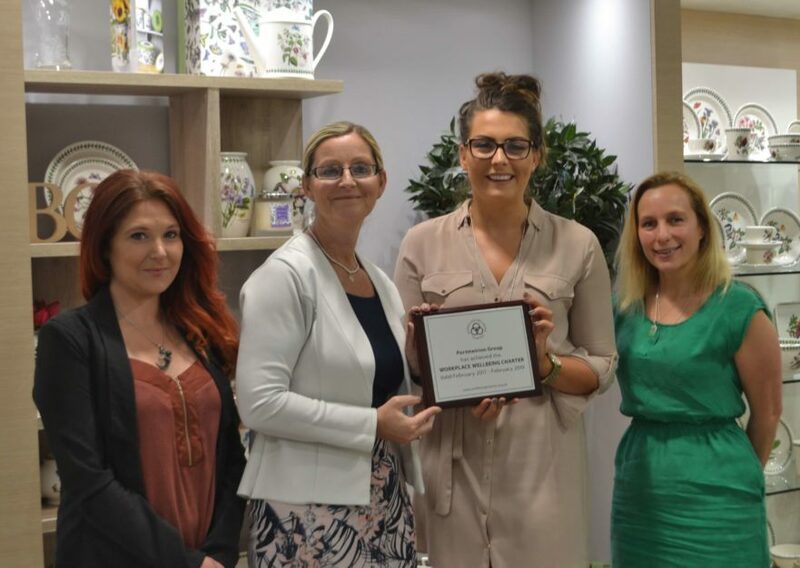 The company was among the first in North Staffordshire to commit to the Charter programme and to benefit from funded wellbeing workshops and one-to-one support from the Chamber as they worked towards accreditation. Adele Cope, Head of Business Growth at Staffordshire Chambers, said: “A healthy workforce can reduce sickness absence, lower staff turnover and boost productivity. “It is good for employers, workers and the wider economy, which is why Staffordshire Chambers of Commerce are supporting businesses by guiding them through the Workplace Wellbeing Charter. “Lesley Mountford, Director of Public Health and Adult Social Care at Stoke-on-Trent City Council said: “The Government approved Charter is a scheme which we fully support and fund in the city. Stoke-on-Trent City Council sees workplace health and wellbeing as an important part of its strategy to improve the overall health of the city, and we are delighted to see organisations such as North Staffs Mind making this commitment”. The Workplace Wellbeing Charter is fully funded by Stoke-on-Trent City Council. To get involved please contact sarah.colclough@staffordshirechambers.co.uk.